With traditional investments more uncertain than ever, investors are looking for solid passive income returns that will weather blips to dips. Real estate is always a safe bet, even though the housing market is prone to the same fluctuations as any other kind of investment. Houses are solid, and unlike companies, which could fold in a recession, bricks and mortar will still be there when the market picks up again. Perhaps the speediest—and easiest—way to make money is through turnkey investments. 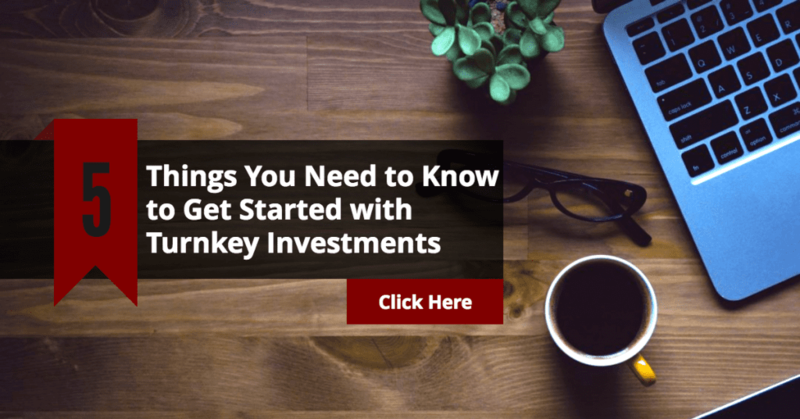 But before you dive in, here are five things you need to know about turnkey investments. Make sure you understand the property, the location, the demographic, and the average rental income for the kind of purchase you’re looking to make. Buying a high-value apartment you’ve seen online might seem sensible, but if it’s in a mostly blue-collar area, you are likely to have periods where the property is vacant due to lack of tenants requiring that kind of home. 2. Do even more research. 3. Use a turnkey property management company. This is the most important thing of all once you’ve passed the research stage. Before you part with your airfare, find yourself a dedicated turnkey property real estate company. These companies specialize in turnkey investments that are ready to rent as soon as you sign the contract to buy them. If you’d like to purchase apartments that already have a reliable long-term tenant, they will be able to offer those, too. The company will take care of everything from weeding the flower beds to collecting the rent, giving you peace of mind and less administrative work to do yourself. Plus, an experienced management company will have seen pitfalls you can’t even imagine, and dealt with them smoothly. 4. All management companies are not created equal. Spend some time on forums of like-minded investors in the areas where you’re looking to buy. Some companies may claim to offer the most comprehensive and reliable package, but if they’re slow to respond to tenant needs or issues, they might not offer the kind of value you’re looking for. Your management company may ask you to enter into an LLC so that they can stay on the title deeds and address structural or other expensive issues without consulting you. This can cause its own headaches, however, so you may wish to look for a property management company that is content to have access to an expense account that you have set up for this purpose. Unless you’re in the business of buying, flipping, and re-selling houses (which can be really risky, not to mention labor intensive!) it will likely take some time to make a profit with real estate. It’s important to think of your investment as one you’ll hold on for a while and be OK with slow and steady growth—it’s a marathon, not a sprint. Working with a property management company, you will get a decent return and also have peace of mind.